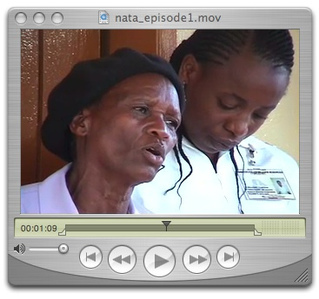 "...The resulting Nata Village Blog is a moving effort, with photographs, stories, and amazing videoblog entries. The blog documents both the challenges and the successes of the residents, clinic workers, and educators facing the HIV/AIDS pandemic...Please, just go visit the blog. It offers its authors and its readers alike a chance to do something profound." Assemblies of god is one of the churches in Nata Village. The Nata Village branch was opened in1997 and the first Leader was Pastor Setlhong. The church has 74 adult members and 64 children. The meetings are. Mondays for prayers. Wednesdays for bible study. Thurdays for ladies (bomme). Fridays are for worship. Saturdays for youth (banana). Sunday is for main service. The church recruits members by inviting them to their different services and by personal evangelism. Assemblies of god has 79 churches in Botswana. The church contributes to the welfare of the village by helping destitutes with food and clothing after collecting them from church members. On the issue of HIV/AIDS the church preaches and talks a lot about abstainance to youth, and faithfullnes to couples. Assemblies of god also offers counselling to those affected and infected with the decease. They tell them to have hope and put everything in gods power, and to take good care of themselves. At the moment Assemblies of god do not have prgrams for youth during school holidays and Kenewang Rancholo encouraged them to think of that, because it would help youth to be busy and even do something for the village during that time. The Nata Village Assemblies of god is now under the leadership of Pastor Naison Kamusha fro Zimbabwe. The church is prepared to help with anything that involves Charity in the village. The church welcomes everyone to one of their sevices. thanks but no thanks to assemblies of god as it always criticize or bad mouth other churches in my community about their services. pliz we always pray the same god. My name is Morapedi Simon. Im very much impressed about the progress of AOG Nata. Most of these comments makes us to grow. Whatever God has purposed concerning this church, Nobody can stop it. The Church of God is moving on. Be encourage in your service to the Lord. We are supporting you. Let me also urge fellow saint to support this young church in their effort to reach out the extents. I fellowship in Assembly of God Kumakwane and Im really inspired by what you are doing there. I desire that fellow congrigations can start to give financial support to others, so that we can be united in our goal. What remarkable post! The Church of God is moving on. Be encourage in your service to the Lord. We are supporting you. An informative blog! My name is Morapedi Simon. Im very much impressed about the progress of AOG Nata. Most of these comments makes us to grow. Whatever God has purposed concerning this church, Nobody can stop it. The Church of God is moving on. Be encourage in your service to the Lord. We are supporting you. The fact that means that you can literally build most people shirt and pay attention to what it will eventually look like before you spot ones sequence. Hellow bakaolengwe in the name of our Lord and savour Jesus Christ.... it is indeed a great honor to see the work that the Church of God is doing around Nata, I for one I was shocked by the progress I saw in Nata when I was there around June. Man of God Pastor Kamushe and the church at large keep the good work continueng. Never think of giving up. remember God said he will be iwith you to the end of the world. allways know that there are people who are praying for you who want to see the work of God progressing. The doctrine of God has bearing on every aspect of life. All those profound questions, such as, ‘What’s the meaning of life?,” “Why am I here?,” “Is there life after death?,” “Why is there something rather than nothing?,” (etc.) are properly understood only through a biblical knowledge of God. So, in order to have a biblical worldview, we must know who God is and what He has done. I am a youth leader at my church in New Jersey, USA and I am grateful that people understand that outreach is important for any church body, from the USA to Nata and beyond. Showing the love of Christ and reaching the lost and the least reaches far beyond the emotional needs to the spiritual core of being human. Thank you for serving. Ein informativer Blog! Mein Name ist Simon Morapedi. Im sehr viel über den Fortschritt des AOG Nata beeindruckt. Die meisten dieser Kommentare macht uns zu wachsen. Was auch immer Gott hat bezüglich dieser Kirche gedachte, kann niemand stoppen. Die Kirche Gottes ist auf Bewegung. Werden in Ihren Dienst für den Herrn zu fördern. Wir unterstützen Sie. wow! this is indeed a great job. Botswana for Jesus. I love it. May all the glory be to Jesus. Thanks for ones marvelous posting! I really enjoyed reading it, you're a great author.I will make sure to bookmark your blog and will come back in the future. I want to encourage one to continue your great work, have a nice holiday weekend! With havin so much content do you ever run into any problems of plagorism or copyright violation? My blog has a lot of completely unique content I've either authored myself or outsourced but it looks like a lot of it is popping it up all over the internet without my permission. Do you know any techniques to help protect against content from being ripped off? I'd truly appreciate it. In case you can acquire any of one's moist or creamy cosmetics in smaller dimensions accomplish that, or try to locate precisely the same products in packaging (for example a pump) that doesn't enable for the introduction of germs. Note this is not just 'love'. It's unconditional. This does not imply that the child are capable of doing what they want without consequences. It lets you do mean they need to know you care for them. They have to be reminded you care for them. Needed those things that prove you care for them. which doesn't include buying love whatsoever, shape or form. Set aside your wallet and work out how the child knows, certainly, which you love them everyday! NO exceptions. None!